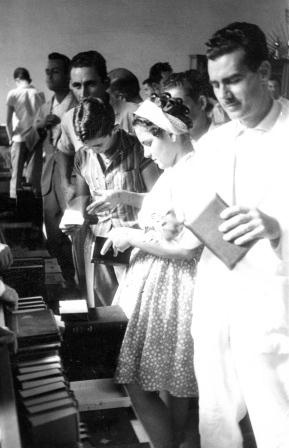 I love this photo of the inaugration of the Uberlandia Book Deposit, August 12, 1963. You know when the chapter of a great book you’re reading ends and leaves you wanting more? You need to turn the page, no matter how late into the night it is. You’ll stay up waaay past your bedtime because the shopkeeper has made a vow to avenge the murder of his son and you absolutely must know how he’ll do that. Or because the young up-and-coming account exec has sent confidential files to her cousin in Borneo, and you need to know…what’s in those files?! I love books like that. A great chapter break is what turns books into those page-turners I can’ t put down. Life should be like that too. Full of interesting twists and turns that make you want to jump into the next adventure, seek out new information, be open to changing your whole perspective on things great and small. Living that kind of life needs to be intentional. There’s always the risk of complacency, getting stuck in a wheel of same, where predictability is the norm and boredom the flavour of each life experience. I feel like I’ve fallen into that wheel a little bit. I’m not bored with my life. Yet, I’ve let the pattern of life lead me instead of weaving it to my own interests and strengths. Maybe it’s turning 40; maybe it’s my girl entering school. I feel a sense of urgency to explore something new, do something different. I need to make the time for it. Make it important part of my life. Life satisfaction aside, doing so makes me a good role model to my daughter. A busy schedule holds me back but so does fear. And both are excuses. * Image sourced via Flickr Commons. Thanks for sharing the link to my post! Glad you enjoyed it. Hi K.M. – my pleasure. Loved your list of “chapter break” ideas!